in Victoria and New South Wales, Australia. Scroll down to see the latest news! Every year a vast network of heritage fruit enthusiasts across southeast Australia swings into action, headed by Neil Barraclough, who is a passionate fruit grower, dedicated to the preservation of our horticultural diversity. This network of volunteers organises the sharing of rare, unusual and heritage fruit trees that are unknown to the world of commercial fruit growers. The Heritage and Rare Fruit Network, under Neil's auspices, also passes down to new generations the ancient knowledge and skills of grafting, with grafting workshops held at the same time as the sharing, swapping and selling of fruit tree material and information. No profits are made, and much voluntary work is done to aid bushfire survivors to replant their orchards. Every year the network grows bigger. More people are becoming involved and more venues are springing up. These "Grafting Days", as they are called, are held in winter when deciduous trees are dormant. Come along to one of these events and have heritage varieties of apples, pears, plums, cherries etc.grafted so you can take home trees to plant in your orchard. Plan for fruit that ripens over the greatest part of the season. Do you know of a delicious old apple, pear or plum in an old orchard and would love to grow one but don't know the name so can't buy one from the nursery (and probably couldn't even if you knew the name)? Bring a few scion (cuttings) along and we'll graft you one so the old tree is rejuvenated and the variety is not lost forever. Perhaps 200+ apple varieties, 50+ pear varieties 80+ plums, 20+ cherries, some quinces, grapes and fig cuttings and a lot more. Create your own local grafting day! Click here to find out how. Scion Swap and grafting at ECOSS Milgrove 10am. Street Address: 711 Old Warburton Road, Wesburn, Victoria, Australia. Scroll down for a list of scion varieties that will be available on the day. Werribee grafting day. Werribee Park Heritage Orchard, Victoria, Australia . Free entry. Time: 10am to 3pm. Map and contact details can be found on their website. Rootstock propagation 1pm at venue to be announced. Apollo Bay area, Victoria, Australia. Terang, grafting for the public and fire recovery. Garvoc daytime fire recovery and grafting for the public. Victoria, Australia. Garvoc, Victoria, 2pm at The Wallaby's Rock Garden. Heritage Farm, Moorooduc on the Mornington Peninsula, Victoria, Australia. The Biodynamic Association is conducting this grafting day but everyone welcome, great chance for anyone wishing to learn more about Biodynamics- John Bradshaw. 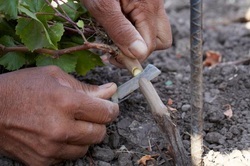 Grafting Day Hosts provide a no-cost location that is out of the sun and sheltered by wind. Workshops last 3-4 hours and numbers are capped at 20 (if there are 1-2 grafters) but can increase if more grafters will be attending. 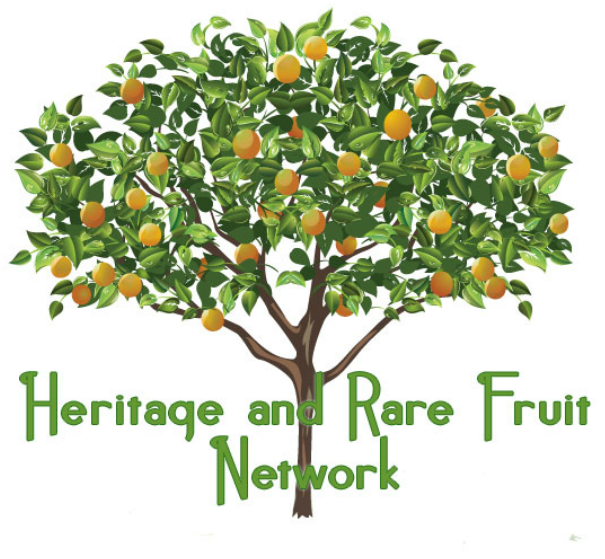 Participants will learn about the Heritage & Rare Fruit Network and how to graft, meet like-minded people and mix while they wait for their fruit tree(s) to be ready. Waiting time for your grafting fruit tree(s) depends on volume of orders and number of grafters helping. It may take quite some time. Ideally hosts note names and contact details of attendees so that each region can continue with educational events and activities in years to come. To keep the workshop price low attendees are asked to bring their own meals/snacks and drinks. 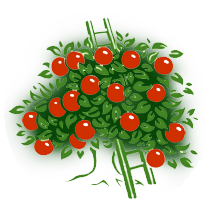 Workshop fee includes a free grafted fruit tree (single scion + non-dwarf rootstock) of choice. Additional rootstocks + 1 scion will be available for purchase around the $8-10 mark with $2 per extra scion. Scion Swap and grafting. Free entry. Werribee Park Heritage Orchard . Meerlieu's Gala Grafting Day, Meerlieu Hall 10am. Free entry. The CERES Community Environment Park, or Centre for Education and Research in Environmental Strategies, is a 10-acre urban environmental centre. 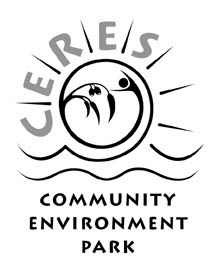 CERES is an award winning, not-for-profit, sustainability centre and urban farm located on 4.5 hectares on the Merri Creek in East Brunswick, Melbourne. Toora Heritage Pear Orchard grafting day at the Toora Hall, 10am Free entry. A HUGE THANKS TO NEIL BARRACLOUGH FOR TAKING TIME OUT OF HIS PERSONAL LEAVE TO COME AND TEACH US AND SHARE THE JOY OF GRAFTING AND HUNDREDS OF DIFFERENT SCIONS. IN ADDITION TO THE SMALL WORKSHOP FEE, ATTENDEES CAN BUY EXTRA ROOTSTOCKS AND/OR SCIONS ON THE DAY. NEIL WILL ALSO BE BRINGING A FEW DOZEN GOOD GRAFTING KNIVES WITH HIM FOR SALE, SO IF YOU (OR PEOPLE ATTENDING) DON'T HAVE ONE ALREADY THOSE WILL BE AVAILABLE TOO. NOT ALL HOSTS WILL HAVE PAYMENT FACILITIES, SO YOU MAY LIKE TO BRING EXTRA CASH ON THE DAY JUST TO BE SURE. Please note that Grafting Days are still in the planning stage and have not yet been finalised. Updates will be posted here as they become available. Fruit Tree Grafting and Frog Bog Planting Day. Annual scion swap in association with their grafting day and a frog friendly workshop. Bring along any plants or cuttings or seeds etc. you wish to swap or sell. Free entry. Time: 10am to 3pm. Map and contact details can be found on their website. One grafting workshop is planned, with emphasis on helping people re-establish orchards after the Wye River fire. Time: 1pm - 5pm - Cost: $20 Benalla Permaculture/Permaculture Victoria members, $30 Public, including Tea & Coffee and one free (1) grafted tree. Additional 'graftlings' available at $10 ea. Cash Only. Contact Kathy Wicks Landline (02) 6364 3207 Mobile 0447 650 600. A cup of tea or coffee will be provided, but please bring your own lunch. Cost is $30 which includes one tree grafted to your chosen variety and please advise Kathy Wicks if you are coming. You will also need to have some plastic shopping bags to take your tree/trees home in and if you can provide any scions of old fruit trees you would like to be preserved, bring the scion and you can have it grafted to a root stock of your choice. If anyone has scions to share, please cut them to 45 mms long and put them in a zip lock bag with a squirt of water. Neil Barraclough is bringing grafting knives he will sell to anyone needing them. 2016 Friday 22 July 2016 - Mudgee, NSW SORRY, SOLD OUT! Cost: $30 per person includes 1 free grafted tree. BYO: Plastic bags to pop your rootstocks and scions in, and bring any scions of your own that you wish to share (see details below of size, ziplock, labelling etc). Non Patented/PBR varieties only. 2016 Thursday 28th July 2016 - Bermagui, NSW SORRY, SOLD OUT! Venue: "The Crossing Land Education Camp", 396 Nutleys Creek Rd, Bermagui NSW 2546. Time: from 11am to 4pm. $10 entry gets you a free grafted fruit tree. Run by the Heritage Fruits Society. Location: Petty's Orchard. The Heritage Fruits Society Grafting Day at The Briars historic homestead on the Mornington Peninsula. The Briars is one of the Mornington Peninsula Shire’s oldest properties first settled in 1840 by Captain James Reid, a retired army officer. 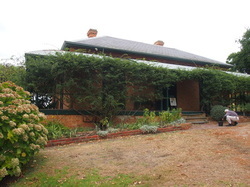 The Briars, a 230 hectare rural property in Mount Martha, is one of the shire’s foremost assets. For continual updates and breaking news as it happens, watch this space! Note: there will also be plums and pears, 50+ varieties of each. Grafting, workshops (seed-saving, advanced grafting, beekeeping so far being considered) and scion exchange between the groups and others. Due to change of ownership (and impending renovations) at Wild Thyme we have had to change venues at the last minute. Yarra Valley ECOSS has previously invited us to have the event at their site, and have very graciously made their venue available for us at very short notice, and a very low fee. 9:30-10:30 Scion Exchange for experienced grafters and other groups. Until 1:30pm Hands on grafting workshop - or we'll graft a tree for you to your request. 1:30 Brief break for lunch TBA - We are now trying to organise on-site options- watch this space. Paul is our avocado expert and will talk about, amongst other things, grafting avocados. All profits of the day will go to local schools running Kitchen Garden Programs. Enter through the main gate (Gate 5) K Road. Evening, details to be announced. Fruit Tree Grafting Day - Monday July 27th - At Lorne Community House. 11am- 3pm. Establishment of Nursery Bed, Propagating Fruit Tree Rootstock, Future Grafting-Stock for Community Projects. $35 (includes grafted fruit tree of your choice). Additional stock available. All bookings and enquiries Swami Samadhijyoti 0415 888 604. Sunday 2nd Neerim South area at 1pm. Venue to be announced. 11am Neerim South Hall $10 entry gives you your first grafted tree, more can be purchased. A BBQ will be there with sausages available for purchase, tea and coffee available also. Monash University date to be confirmed early in the week. Meerlieu Hall, 10am start. Contact Neil Barraclough on Facebook. Quambatook Community Garden Project grafting day at the Senior Citizens Hall Olive St, 9am to 2pm Contact Carolyn Gemmell on Facebook. Grafting day Sunday 16th August for the Toora Heritage Pear Orchard, Toora Town Hall starting at 10am. There are many apple varieties with some plums and pears also (all subject to availability). Come along to see how grafting is done. Talk to members about the best fruit varieties. Everyone welcome. Great venue in a lovely part of the state, so if you are in Melbourne or just east of it come along to the first grafting day of the season. Contact Neil Barraclough. We are encouraging everyone with scion to share/swap/sell to come along and also working on encouraging people who are able to email a list of what they have so it would be available for people to share within their groups before hand. This would give anyone going to a grafting day the chance to get varieties they are looking for or maybe work as a group to maximise the diversity in their group. People can bring along grape, fig or any other cuttings, potatoes, seeds, any plant material they choose to share/swap/sell. Groups can also pick up their rootstocks on the day with prior arrangement. Please contact Neil if you would like to come and if you have any skills/knowledge to contribute to a workshop. Note - Enter via Gate 2, park in Werribee Park's visitor car-park and walk to Orchard via Formal Gardens. contact Richard Hawkey or Craig Castree. There will be a grafting workshop in the Bengworden Hall on Wednesday 23rd July starting at 7:30pm if there is enough interest. We do do demonstrations at the... grafting days but usually there isn't enough time to spend with people wanting to learn. This will provide an opportunity to be part of a small group and get much better instruction and hands on tuition. $5 to cover hall hire and a cuppa. RSVP to Neil Barraclough, if there isn't enough interest by Monday 21st it will be called off. Sunday 27th Maidstone.contact Craig Castree or Richard Hawkey on Facebook. Saturday Aug 2nd in the afternoon. Contact Steve Burns. Sunday Aug 3rd in the afternoon. Contact Steve Burns. Address: Homestead Rd, Templestowe, 3106 Victoria, Australia. Melway 22 A11. Free entry. Sunday 3rd August Mansfield (to be confirmed) contact Neil Barraclough on Facebook. Thursday 5th August Seymour Contact Julie Downey on Facebook. Saturday 9th August Meerlieu contact Neil Barraclough on Facebook. Saturday 16th August Toora Contact Neil Barraclough on Facebook. Sunday 17th August Sale Contact Andrew Young on Facebook. Yinnar is a tranquil rural township located in the Latrobe Valley, in central Gippsland, Victoria, Australia. October 4th Apples and pears in pots at Wollangara Pioneer Skills day/weekend. Contact Neil Barraclough on Facebook..